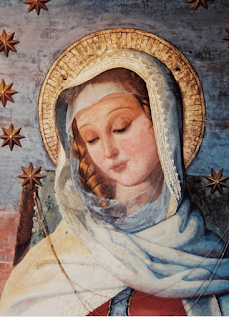 The image of Mary as a young girl, known as Mater Admirabilis, holds a special place in Sacred Heart schools throughout the world, and in the hearts and memories of former students of all ages and backgrounds - none more so than in the USA. A few weeks ago, in the run up to the feast of Mater, our American sisters created an online poll, asking the question: How does Mater speak to you? There were four options to choose from: Being gentle, kind and compassionate; Responding to the needs of the world; Being serene and calm; Being generous and joyful. As I shared the poll onto our Province's Facebook page and Twitter feed, and started typing Cast your vote for... I was struck by the poignancy of urging our followers - many of them in the US - to cast their votes for gentleness and compassion or for responding to needs; for generosity and joy or calm serenity. These are words which have sadly been conspicuously absent from the US presidential election campaigns: instead, we've seen allegations of sexual assault, criminal behaviour and ballot-rigging, anger, insults and a generally vitriolic, deeply divided atmosphere. Here in the UK the EU referendum unleashed a hitherto largely contained ugliness and xenophobia whose effects will scar and damage us for many years to come, but the ugliness we can see in the US campaigns feels overwhelmingly greater and more frightening. And in the midst of all this ugliness members of the Sacred Heart family cast their votes - in a poll whose only options were positive qualities which speak of love. Interestingly, the overwhelming majority (67%) chose 'being gentle, kind and compassionate': in the midst of so much which is so definitely not gentle, kind and compassionate, these are clearly things we all yearn for. Undoubtedly they are attitudes we all desire to grow and deepen within ourselves, but maybe there is also an unmet longing in all our hearts for attitudes and actions which speak of humanity, respect, care and love in politics and public life. Here in the UK as we struggle with Brexit-induced violence and hatred; in the US as people cast their votes, knowing that whatever the outcome, it will bring more difficulties, vitriol and instability... in Calais, Syria, and so many other places throughout the world, gentleness, kindness and compassion are so sorely needed as never before. May the example and prayer of Mary, Jesus' admirable Mother, inform our choices, deepen our desire and inspire us all to work, however we can, for an increase in gentleness, kindness and compassion in our families, neighbourhoods and throughout our bruised and hurting world.